Shadow Creek Ranch has a rich and well-documented history that is almost as vast as its amazing landscapes and wildlife. We hope you enjoy learning about the events that transpired to bring you this amazing ranch. 1800’s – Ute Indians and mountain men trapped in the area. 1880 – Frank Smith Sr. It was called The Smith Ranch. Frank Smith Sr. and wife, Elizabeth, had 13 children, of which 9 survived childhood. Family members and hired hands were asked to homestead 160-acre parcels each. Frank Smith Sr. would then buy the acreage back from them. Frank Smith Sr. youngest son, Earl, homesteaded the Base Camp area from 1900-1940’s. Earl Smith family homesteaded most of the ranch by 1900. William (Shorty) Smith developed the Mesa Area. Frank Jr. homesteaded the southeast side of the Mesa, along Deep Creek. The Sawmill (Meadows) was managed by Clyde Edmondson in the late 1940’s early 50’s. 1800’s-1903 – The Sutton’s (Bertie Sutton’s father) homesteaded the Sutton Meadow area. Each family member homesteaded 160 acres. They leased the land to the Smith’s for many years. The Smith’s bought it in the 1920’s & the Sutton became part of the ranch. Used the ranch for summer pasture. The old round corral northeast of main homestead building was used for branding in the spring. 1928-30 – The current Equestrian Center and employee housing area was built. House – Ranch Manager’s house now. Bunkhouse – Ranch Manager’s garage now. Chicken house – Stone Building. Old barn – Built in 1929 & then burned down in the 1990’s. Log barn – where the arena is now. Built of big, big timbers. 1935 – Frank Smith Jr., married to Clara, and Earl Smith bought out the rest of the family when Frank Smith Sr. died. Later Earl Smith bought out Frank Smith Jr.
1957 – Earl Smith sold to Ted Orr Sr.
Ted Orr Jr. married Frank Smith’s granddaughter, Virginia, and took over the operation of the ranch. They built the old barn that still stands. The Orr’s kept the ranch up in style. Ted and Virginia Orr had a son named Jack. 1969 – The Orrs sold the ranch to the Quarter Circle V Corporation (Alvin Buerger Family) from the Jack Orr interests. The Smith Ranch was now called Spring Creek Ranch. Herbert Buchwald went bankrupt and Aetna/Met Life Insurance took over. Aetna leased out the ranch. 1989 – Nelson & Neecee Lane purchased the ranch from Aetna Insurance. They renovated Base Camp and built the sauna. 1999 – The Lanes sold the ranch to Elk Dance LLC for a luxury home site development. The Spring Creek Ranch was now called Shadow Creek Ranch. Elk Dance LLC put in the gravel roads, water and electrical system, and the conservation easement. The “New” Barn and Indoor Arena was built in 2000. Carrie’s, Ginny’s & Lauren’s Cabins was built in 2000. The Guest House was built in 2001 and used as a lodge until December, 2001. The Lodge was completed in December of 2001, just in time for Christmas. 2003 – Shadow Creek Partners, owned by Roger Wikner, acquired the development. Shadow Creek Partners upgraded the development and continued to market the ranch. Shadow Creek Partners built the Fishing Cabin in 2009. Roger Wikner passed away in 2012 after successfully selling most of the developer owned home sites. This marked the end of developer involvement at Shadow Creek. Equestrian Area – Built by Frank Jr. in 1928-30 or so. Meadow near Lodge – Homestead of Frank Smith Sr. in 1880. The Mesa – William (Shorty) Smith a bachelor, early 1900’s. Deep Creek (Southeast of the mesa) – Frank Smith Jr.
Sawmill Meadow – Clyde Edmondson ran a sawmill for Earl Smith in the late 1940’s to early 50’s. Base Camp – Earl Smith, youngest son of Frank Smith Sr. homesteaded here from 1900 to 1940’s. Base Camp cabin was Earl’s barn. The house was located between the Base Camp pond and the Base Camp entrance. Sutton Meadows – The Sutton Family homesteaded from the 1800’s to 1903. It took incredibly hard work to develop this. Old building next to Martin Creek Cabin – One of the Sutton boys, at age 15, got mad at his dad and ran away from home and built that cabin. 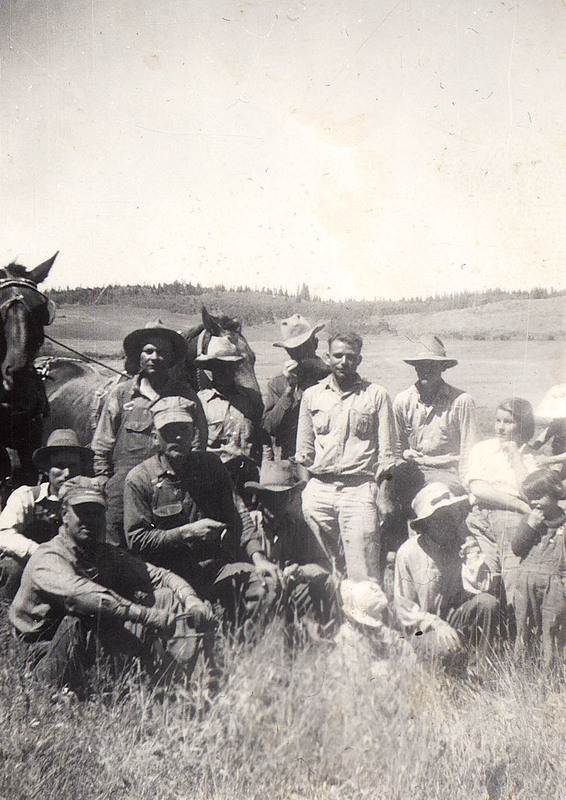 Ditches – Hand built using a few horse teams during the 1920’s & 30’s. The Noonan Ditch was built by the Noonan Ranch, which is now Blue Valley Ranch. It is the property of and is maintained by Blue Valley Ranch. Even though it runs through most of Shadow Creek Ranch, Shadow Creek does not use water out of the Noonan Ditch. Fencing – Barbed wire was put up in the 1930’s. Buck & rail was used before the 1930’s.